The Federation of Unions of South Africa (Fedusa) has called for two former Public Investment Corporation (PIC) directors implicated in allegations surrounding VBS Mutual Bank to be declared delinquent. The trade federation issued a statement on Sunday calling for former executive head for legal counsel, governance and compliance Ernest Nesane and former executive head of risk management Paul Magula to be declared delinquent directors over alleged impropriety in their roles on the board at VBS Mutual Bank. The mutual bank was placed under curatorship by the Reserve Bank earlier this year due to a liquidity crisis. Fin24 on Friday reported that Ernest Nesane resigned from his position as executive head for legal counsel, governance and compliance. Magula was dismissed by the PIC earlier this year following a disciplinary hearing where he was found guilty of charges made against him. In a statement issued on Friday regarding Nesane’s resignation, the PIC noted the serious allegations by the directors since the commencement of the VBS inquiry. Fedusa wants the pair to be declared delinquent directors for “failing to apply the highest standards of ethics and good corporate governance”, the federation said in its statement. 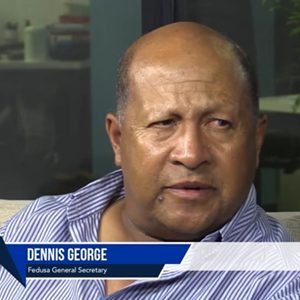 “The effect of an order which declares a director delinquent is that the director is disqualified from being a director of a company in terms of Section 69(8)(a) [of the Company’s Act] in future,” said Fedusa General Secretary Dennis George. According to the act, the court order could be unconditional and could last for the lifetime of the director or seven years or longer. “It is important to recognise that both Mr Nesane and Mr Magula have a duty of care to ensure they observe their fiduciary responsibilities relating to the business practices and apply the highest standards of ethics and good corporate governance,” fedusa said. The federation added that Magula and Nesane cannot “escape” a court order being issued against them, even though they are both no longer at the PIC. The City Press on Sunday reported that the pair were allegedly paid millions by the mutual bank's majority shareholder Vele Investments. According to the City Press they both got paid R5m, to "look the other way" while the bank was looted. “The latest revelation is an indictment on the PIC’s poor investment choices and lax internal control mechanisms which failed to detect that their representatives at VBS had ‘been bought’ and could no longer be trusted with fiduciary responsibilities,” said DA MP Kevin Mileham. The DA wants the South African Police Service investigation into VBS to be expanded to include the PIC and those implicated must face criminal charges and pay back all the money they received illegitimately.